Experience the joy of indoor cycling. Our signature ride! This ride is heavily focused on performance metrics and high power outputs, aimed at setting new PR’s. Love competition? This ride is for you. Less competition and more jamming out to the rhythm of the music! Get ready to sweat, burn some serious calories and have a lot of fun. Think yoga on a bike. This zen ride focuses on motivational training methods that will get you through the tough climbs. A great way to start or end your day. A 30-minute express class over lunchtime! Separate packages are available for these shorter classes, please scroll down to the Express Lunch Packages on our pricing page. Keeping things fresh, one fun playlist at a time. Check the schedule to see where we’ve sprinkled in these fun theme rides. Have an idea? Let us know! A monthly, donation-based series that allows us to support causes that are near and dear to our hearts. 100% of the proceeds will go towards the cause. Our mission is to provide the area’s most innovative fitness experience with the best technology and the best instructors. We’ve paired the ultimate studio bike with performance data tracking to help push members past their fitness goals with live metrics and a post-class summary report. The studio is equipped with 20 custom branded Stages SC3 bikes that have built-in consistency and precision. This smooth-riding, easy to adjust, state-of-the art bike is equipped with Stages Power® Meters and features the Stages SprintShift™ that allows riders to control resistance in two ways for a truly custom experience. The Stages Power Meter is the most accurate, lightest weight measuring tool in cycling and is changing the indoor cycling industry. Now indoor riders can benefit from the precision of training with power. Whether it is counting calories or logging in-depth interval statistics, Stages Power technology provides the most accurate results ensuring the truest ranking for the most competitive workout. Improvement begins with the right information. Their philosophy? Knowledge is Power. Each bike has its own self-generating console displaying your current power (watts), cadence (RPM), speed (MPH) and distance (miles). The bikes seamlessly and wirelessly connect to our technology via Bluetooth® and ANT+™. We integrate them with Performance IQ software to show a live leaderboard in the front of the room. Riders are also welcome to pair their own heart-rate monitor devices to the bikes. Performance IQ allows us to monitor every rider’s performance in real time using group display at the front of the room. The leaderboard has a wide range of functionality allowing us to rank the riders based on watts, RPM or total energy output. Don’t worry, the system doesn’t display any names but instead uses each rider’s unique bike number. PIQ is also used to gamify the class by conducting live races and other drills built into the workout. We’ll create teams and race on the big screens to see which team prevails! Another PIQ feature we’re excited to use is FTP testing and training. Once your individual FTP (Functional Threshold Power) is determined, we’ll use colored zone training to help determine how hard you should be working. The best part? Immediately after class you’ll get emailed your individual performance summary allowing you to track your progress over time. You’ve probably noticed we’re big data people over here — we believe in measuring success! We’re turning workouts into an immersive experience with our concert-like atmosphere — a dark room with fun accent lighting and loud music hand curated by our instructors. Just like the content you see on Instagram and in the movies! Our Phillips Hue lighting system creates the most epic visual experience. Prepare to have your senses invoked! Book your bike online in advance! No need to rush to class and pray there’s a bike left for you. Simply choose your class from the online schedule and it will then prompt you to choose which bike seat you’d like to reserve. Share your bike number with your friend so they can snag the seat next to you! We want everyone to get the most efficient ride possible so we’re including free shoe rentals in all of our memberships. Don’t worry, we’ll show you how easy it is to clip in! Both workout and shower towels are also included. It’s a pain to always remember to pack your padlock or to wear that annoying key wrist bracelet. To make it easier for our members, all lockers come with digital locks that reset after each use. You’ll create a temporary 4 digit code, store your belongings and enter that same code after class to unlock it. After class you’ll have your individual performance summary waiting for you in your inbox. Save your reports to track your performance over time as you get stronger and faster. Want to get a workout in before work or over your lunch hour? We got you covered with an onsite shower stocked with towels and salon-grade shampoo, conditioner and body wash. We want to help make your gym bag a little lighter! Convenience is our goal. Our bathrooms are stocked with deodorant, body lotion, cleansing wipes, hair ties, bobby pins and feminine products. If you forgot something, we’ll likely have it! So next time your hair tie breaks mid-class and your wrist is empty (the worst feeling ever), we’ve got you covered. Thanks to our lovely and healthy neighbors, the studio’s fridge is stocked with fresh juices and snacks for sale. Freshii is also offering our members 10% off all purchases directly before or after your class. Simply show them your online bike seat confirmation with the date and time. Thanks, neighbors! We’re so excited that you’ve decided to sign up for a class! Here are some tips to make your first visit to the studio a breeze. Ps — don't worry if you’re nervous, we all have to start somewhere! 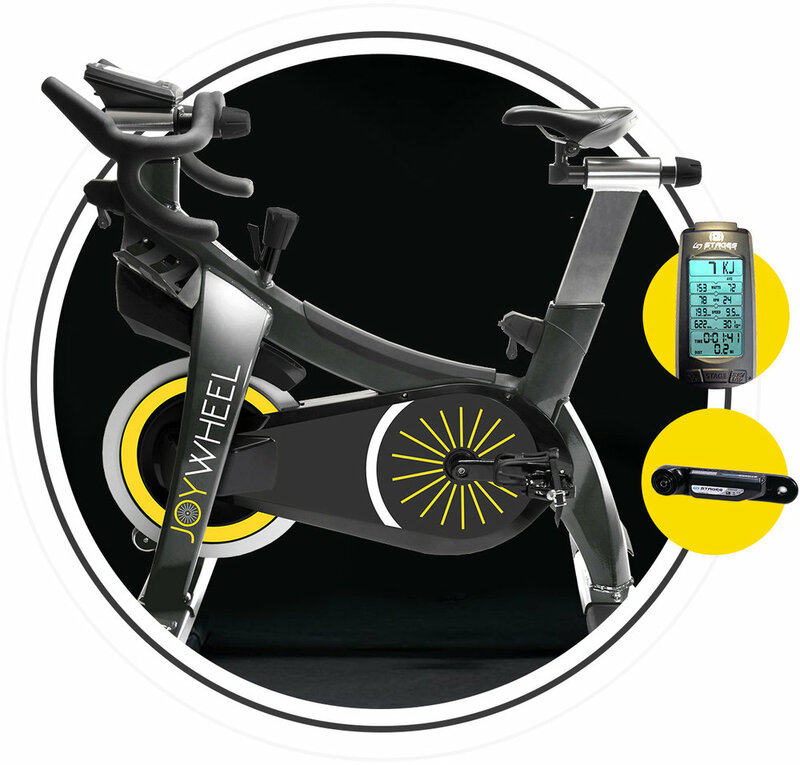 Joywheel is geared for all fitness levels and our instructors will help tailor the workout to your capabilities. Before you know it, you will be addicted and ready for more! Come early! Be sure to arrive at least 15 minutes early to the studio. Let the instructor know it’s your first time, they’ll give you a tour and a full run down of the Joywheel experience. They’ll ask you to sign a short waiver, but you can also do this online ahead of time. Doors will lock once class has begun, so make sure you get there early! This is not a workout where you can arrive late and try to casually sneak in the back. Please be respectful of your fellow riders and arrive early so we can all start on time. We recommend hydrating well before class and making sure you pack socks and a water bottle. Bottled water is also available for purchase should you forget to bring your own. Upon arrival, check-in using the iPad kiosk at the front desk. If you’re dropping in and aren’t already signed up for a class, tell the instructor you’d like to join the class. They’ll get you registered and ready to go. We have you covered with complimentary clip-in shoes for every ride! After checking in you will grab your size from the front desk and we’ll teach you how to clip into the bikes. If you want to bring your own shoes, all of our bikes accommodate SPD cleats. For your convenience, we have digital lockers available to keep your stuff safe while you're in class! We ask that you leave all belongings (yes, even your phone!) in the lockers during class to keep your mind free of digital distractions. We encourage snapping all your social media posts after class! Our team is here to ensure your first ride is motivating, hassle-free and memorable. They’ll help you get set up on your bike by showing you how to clip in and how to adjust the bike to fit you best. We do have an arms portion during the class so be sure to check that you have the right size of dumbbells on the back of your bike. Once you’re settled into your bike, try exploring your personal console. Our consoles measures wattage, RPM and calories. Your instructor will use these numbers throughout class for the ultimate workout! If numbers aren’t your thing, feel free to ignore their suggestions and just ride. Then it’s time to start warming up and getting ready to experience your new favorite workout. Leave your worries (and your phone!) outside. After your ride check your inbox for your performance summary email. This will be a detailed report of your individual metrics that allows you to track your progress over time as you get stronger and faster. Use this data to set goals for your next ride. Be sure to stay hydrated throughout the remainder of the day. If you experience any unusual or persistent symptoms after your ride, we recommend consulting a medical professional. Your safety during class is extremely important to us! Early arrival ensures that our knowledgeable staff is able to help you find the proper settings on the bike to protect your knees and low back. Once clipped in, every bike has an emergency break. Push down on the black resistance knob in the center of the bike to stop the pedals from moving. Take a moment before each ride to check in with your bike and your body. Make sure all the bike adjustment knobs are locked in and tight, and your shoes are securely clipped in. Throughout your ride, listen to your body! Drink water and participate at a level that is safe and right for you. Our instructors will motivate and inspire you, but there is nobody judging you, so please listen to your body and work at a pace that is comfortable for you. If you have any questions at any time, please don’t hesitate to contact us. In order to get started, you need to sign up for your own online account. Once you have created an account, you need to purchase classes in order to reserve a bike. Please arrive 15 minutes early so you get properly set up with the bike and can familiarize yourself with the studio. Make sure you tell instructors about any concerns or special needs. Need more help getting started? Give us a call anytime! Please note that riders will not be permitted into class if arriving late. DO I NEED TO CHECK IN WHEN I ARRIVE TO CLASS? Yes! By not checking in, you are considered a no show. You can run the risk of losing your spot and being charged a no show fee. You also won’t receive your post-class performance summary. To check in, simply use the iPad kiosk at the front desk. If there’s a line, you can also have the instructor check you in. Yes! For safety reasons and biomechanical efficiency (meaning you work the muscle groups correctly), we require the use of our complimentary cycling shoes. All pedals are SPD compatible. If you signed up in advance, your correct shoe size will already be waiting for you at check-in. If your shoes are not laid out, tell the instructor your shoe size and they’ll grab you a pair. We all have busy schedules, so we do our best to start and end classes on time. Please come at least 10 minutes before class to check in and set up your bike. New riders should plan to come 15-20 minutes before class to be properly set up and to get situated with the studio. Joywheel reserves the right to give your spot to someone else if you have not checked in 5 minutes before the start of a class. DOORS WILL LOCK ONCE CLASS HAS STARTED. All reserved classes must be cancelled 8 hours before your scheduled class. There will be a $10 cancellation fee if you cancel outside of that window. THERE ARE NO EXCEPTIONS. If you need to cancel within the appropriate time, just log into your account and remove yourself from the spot. You will not be charged if you cancel at least 8 hours before your class. If you require further assistance, you can call the studio. Please do not email cancellations. Email cancellations will not be honored. Private group classes require that you cancel 24 hours ahead of time. If you are unsure of making it to class, please wait to sign up. If you’ve already missed the 8 hour window, but know you can’t make it, please be a good human and still let us know so we can give your seat to a waitlisted member. HOW SOON CAN I RESERVE A CLASS? Our schedule is released every Sunday at 5pm to book classes for the next 2 weeks. If a class is full, you have the option of signing up for the waitlist. Once on the waitlist, you will be notified if a bike reservation becomes available. In order to be on waitlist, you must purchase classes. If you are on the waitlist it is assumed that you wish to take the class. REGULAR CANCELLATION RULES APPLY. That means you must remove yourself off the waitlist if you are not planning on taking the class. 10 class packs expire 6 months from the date of purchase. 20 class packs expire 1 year from the date of purchase. Please be sure to use all class packs before they expire to avoid losing classes. DOES joywheel OFFER PRIVATE group CLASSES? Yes! Joywheel offers private group rides, corporate rides and ride/fitness parties. These are great for corporate events and team building, birthday parties, bachelorette and wedding parties and more. Please contact studio@joywheelcycling.com for more information. CAN I SHARE MY RESERVED CLASSES WITH ANYONE? No. There is no class sharing. Shoes and towels are provided, but you will need to bring socks and a water bottle. The studio does have a water dispenser if you need to fill your bottle. We like being green! You may also purchase water at the studio. Make sure to wear comfortable exercise clothing, you will be sweating a lot! To prevent injury, please avoid loose clothing to avoid them snagging on the bike pedals. Yes! We have two unisex bathrooms, and one of them has an ADA compliant shower complete with towels. Both bathrooms can be used as changing rooms where you would be able to change and freshen up using complimentary toiletries. CAN MY CHILD TAKE CLASSES? Your child needs to be at least 14yrs old and you must sign a parental release/waiver to allow your child to participate in our classes. Once parental permission is granted, your child can attend classes as they please. Unfortunately we are unable to offer child care.